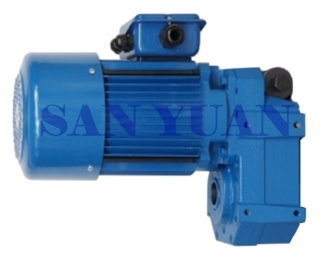 They are specially designed with the output shaft parallel to the motor shaft but not in line. Both hollow shaft and normal shaft types enable space saving designs. Like all helical gears these units provide high efficiency, cost competitive gear parts and other benefits. With precise machining and accurate assembly, our hollow shaft geared motors reach outstanding performance and high efficiency. The modularized design to connect with different types of gear box and wide range of ratios provides economical solution to meet customers' needs. Motors comply with the DIN VDE 0530 specification for electrical machinery and VDE 0171 standard for motors with increased safety respect. The standard motor protection is IP54 according to IEC60034-5 standard. Higher protection grade is also available on request. ♦Please advise the type of starting (direct-on-line or star-delta starting) when placing orders. Standard Insulation of 220V motor is B grade, and F grade for 440V. ►We reserve the right to change ratings, data, and dimensions without prior notice due to further product improvement. instructions and applicable safety regulation.